"Meditation more than anything in my life was the biggest ingredient of whatever success I've had”. There is absolutely no doubt in my mind that meditation is one of the best things we can do for ourselves. Deepak Chopra, Oprah Winfrey, Arianna Huffington, Rupert Murdoch, Steve Jobs, Ellen Degeneres, LeBron James, Gisele Bundchen, even Russell Brand, all meditate. Ray Dalio, the billionaire founder of Bridgewater Associates, said “Meditation more than anything in my life was the biggest ingredient of whatever success I’ve had”. So, knowing this, why do I struggle with meditation? I have read about the benefits of meditating. I have dabbled in it on and off for years. But you know what my issue is? 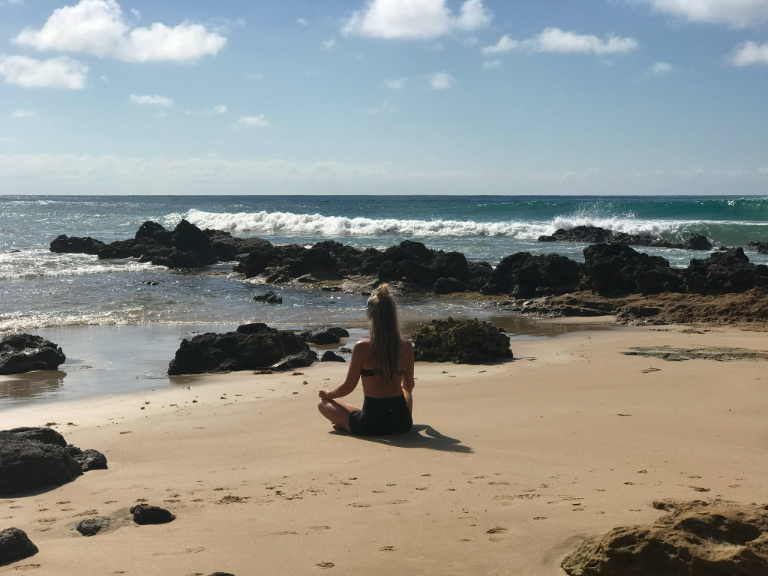 Meditating is about putting yourself first, something I (and many mums and others) struggle to do. There is always laundry to do, deadlines for clients, and my absolute favourite thing to do – spending time with my baby boy. Isn’t that more important than anything else in the world? All of these things seem so much more important than spending time on me. But are they really?! When I meditate, everything just falls into place. Life flows better. My usual crazy mind is a lot calmer. My relationships are full of even more love. My friendships are more solid. My baby boy loves me even more as I am more present with him and I make even more quality time for us. So why on earth wouldn’t I make 20 minutes twice a day to meditate?! For me, I struggle with it because I find there are so many rules. You need to meditate twice a day for 20 minutes. You shouldn’t meditate after 5pm. You need to sit up. You should meditate in the morning and afternoon. As a working mum, this doesn’t always work for me. We all have different cycles. I am not the type of person to do things in a mediocre way, I’m either in or out. I want to give everything 110 per cent. The morning meditations I have always found OK as I get up before everyone else and can meditate before or after I exercise. But it’s the afternoon I struggle with. Not because there isn’t time – there is ALWAYS time – but I don’t make time. If I am in my work flow, I don’t want to stop. I want to tick all boxes and complete all tasks and release that thought before I pick up my baby boy. My speedy mind is one of my assets. I can run through my entire week in a few seconds, including the ingredients we need for a dish we are making next Saturday. So for me, the best time to meditate is after I put Axel in bed, or my preferred time, just before I go to sleep, when my mind is a lot quieter. If I can, I will meditate in the afternoon as well. But I find it challenging when I am told I have to meditate at a certain time. After all, isn’t any meditation better than none?! sleep, when my mind is a lot quieter. If I can, I will meditate in the afternoon as well. But I find it challenging when I am told I have to meditate at a certain time. After all, isn’t any meditation better than none?! When it comes to meditation, you have to find out what works best for you. I found mantras challenging so I tried concentrating on my breath. I breathe in the good energy and release the bad, which works really well. When making a commitment to meditate, I stumbled across One Giant Mind. Thank you, universe. I have found it to be BRILLIANT. Founders Jonni Pollard and Laura Poole take you through all the steps of meditation and educate you on what to do, and the beneficial effects it has on your mind and body. There is a 12-step process, then a 30-day challenge. And the best thing is, it’s free. Deepak and Oprah have also launched a meditation app, which I also LOVE. They talk you through the chosen topic for the day and set up your mind to meditate. I have also completed the most MIND-BLOWING meditation program with meditation master teacher Kat John. Kat uses a guided meditation (which is my preference). She has this ability to bring me back to moments in my life to release bottled feelings I have been holding onto. She brings me to that exact moment, which allows me to understand why I am the way I am. If you are looking for a teacher, I can’t recommend Kat highly enough. Not only does she have the face of an angel, she is a shining light in this world. Everyone has a different form of meditation. When kids play crafts or with lego, that is a form of meditation, something as adults we stop doing. It could be martial arts (boxing has done wonders for Jesse and I) or even surfing. Whatever keeps your mind quiet and tapped into the present moment. Meditation is not about sitting still with your legs crossed looking like a monk, it is whatever form you desire it to be. My advice to everyone is to give meditation a go and see what works best for you.I) or even surfing. Whatever keeps your mind quiet and tapped into the present moment. Meditation is not about sitting still with your legs crossed looking like a monk, it is whatever form you desire it to be. My advice to everyone is to give meditation a go and see what works best for you. A few things I have learned along the way. If I’m stressed or in traffic or running late, I use my thumb and touch on each of the tips of my fingers and say “peace, begins, within, me, (thank you Gabrielle Bernstein.) Or I simply take six deep belly breaths. It’s amazing how the simplicity of slowing the breath can make a huge difference to our minds. For the past six months I have made meditation a priority and I honestly cannot believe the changes that have occurred. So why not give it a try? You could end up being the next Oprah.